Smart packaging – filled with baby food! This was the winning entry in this year’s Billerud design competition SPICE: 12 at Berghs School of Communication in Stockholm. This is the third year in succession that Billerud, the design agency NINE and Berghs School of Communication have organised the SPICE (Sustainable Packaging & Innovation Communication Event) design competition. Over the course of six weeks, 12 teams of students of graphic design and project management have been working on this year’s challenge – to improve food company Semper’s existing baby food packaging and associated storage jars. ”It’s been a really exciting journey to follow the work of the students. And the results have exceeded all my expectations; to come up with such well thought-out and exciting design concepts in such a short time is impressive,” says Marina Eriksdotter, Group Brand Manager at Semper. 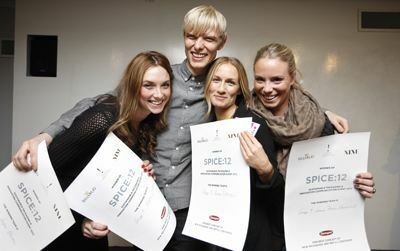 The proposal the jury liked best came from Emma Fällman, Jesper Olsson, Kajsa Jacobsen and Louise Persson. “This is a concept that went the whole way. A fresh approach to the development of packaging, really delightful illustrations and a presentation video on the contentment of baby food that went straight to the heart,” commented the jury. “We began with Semper’s symbols: the red colour, the child. The emotional expression. And then we built on them,” says Kajsa Jacobsen and Jesper Olsson. For the students the presentation to the jury was the finale to a hectic period that included a visit to Gruvön, Billerud’s paper mill, and talks on Billerud’s fibre-based products. “The importance of product packaging is growing all the time. SPICE fits in well with Billerud’s customer offer: to develop smart, sustainable, value adding packaging. It gives us a unique opportunity to build a close relationship between the designers of the future and our products,” says Jimmy Nyström, Business Development Director at Billerud. First prize now awaits the winning quartet – an inspiring journey to Berlin. All the prototypes and presentations will be featured in an exhibition at Semper’s headquarters in Sundbyberg. “Then we will sit down in peace and quiet and think about how to proceed with all the ideas we have gained from the SPICE project,” says Marina Eriksdotter.